There are "many ways to skin a cat", an unfriendly saying but the meaning is right. As for designing fine jewelry the saying holds true. When I am asked to create ideas for stones a customer might own I consider 2 main things, will it make sense to the customer and how can I save some time in creating the design. I need to save time because there is often a time frame the client has or that I have if work is a little backed up. Rushing a design in reality is nearly impossible because ideas come to us, and often when we least expect them. But as practiced designers it happens that we end up with a large reserve of ideas that have worked in the past or newer ones that one just wants to try out. Not to wax too philosophical, I do feel that there is meaning in the mere act of creation whether it is in the arts or sciences or any other discipline. In the end we are all trying to say about the same things just in different ways, and with different modalities, much like there are "many ways to skin a cat"
When I approach a design with pencil, pen, watercolor and goache, like the drawing above, I have a sense of looseness in mind. I just hope to give a client a feel for the stone groupings and the colors of the gems and metal. This would be a good way to invest just enough time to give the prospective client ideasfrom which to give feed back, like whether the direction taken was correct. 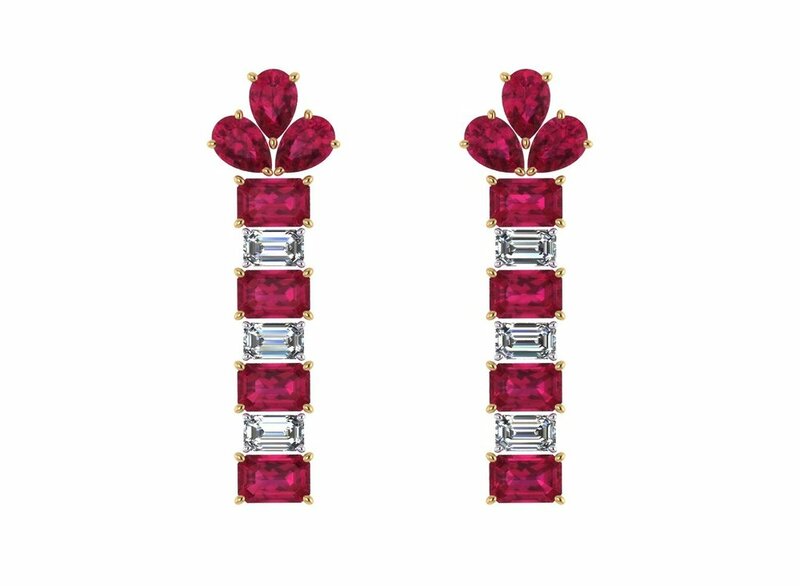 I was about to take this approach to designing for earrings with very specific sized stones, emerald cut rubies and diamonds. 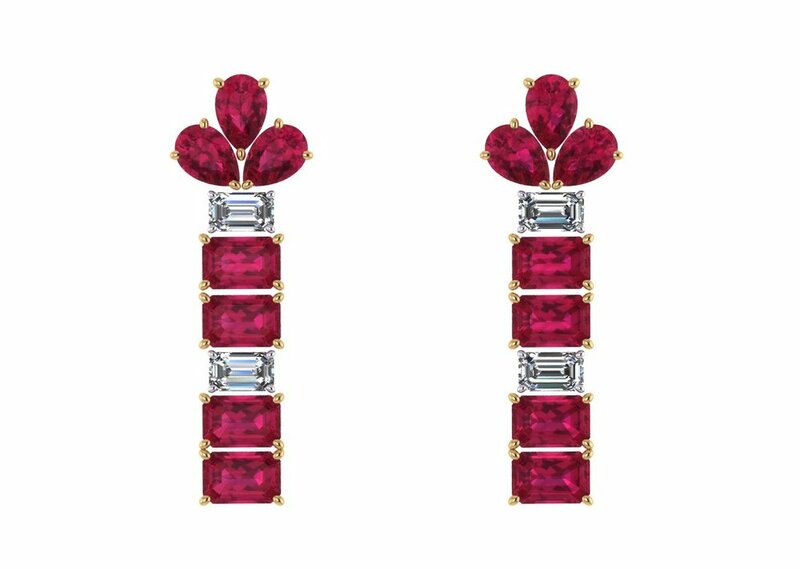 The rubies were all the same size and the diamonds were a little smaller and all the same size, I was ready to go at it. But when Gregore looked over my shoulder and remarked I would be there all night, which I did not want to be, I though I would ask if he had another suggestion. He did, he always does, which is why it's fun and lucky to share a workshop with my husband. He said to throw the stones into CAD and go from there. Matrix software is pricey but it has some handy tools, and one of them is their emerald cut stones. We often create our own stones with lines and sweeps to match real cut stones that are often cut a little off to conserve weight and color. We need those specific stones in CAD to create the correct setting for them. But in this case I just needed a standard size without any concern about stone depth or any other irregularity. 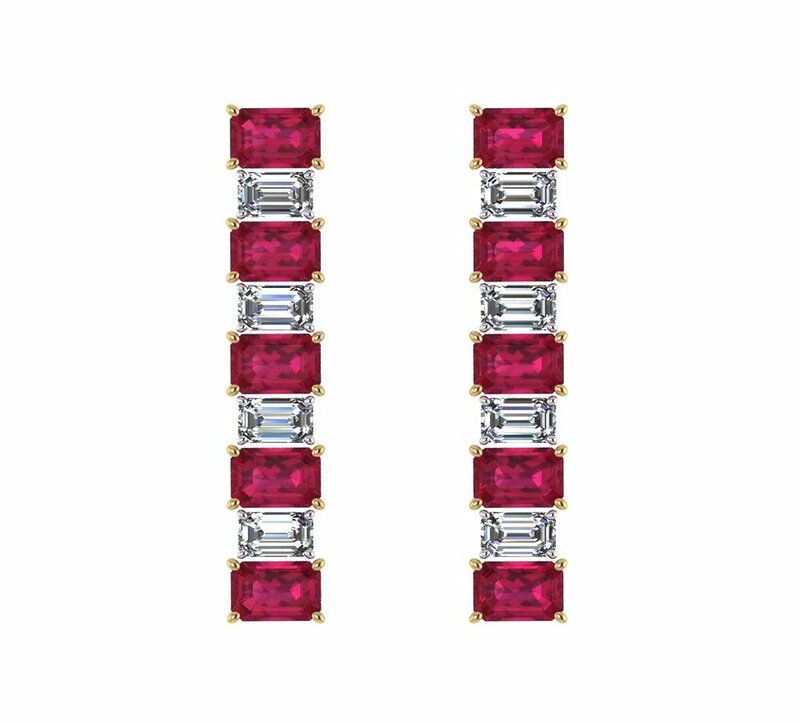 For the most part many classic stones, Sapphire, Ruby, Diamond, are cut to some common standards. At any rate the CAD drawing with it's copy paste feature allowed me to create an array of ideas without too much sweat off my brow. I like sayings can you tell?! The client actually asked for stones in a row vertically, but I like hoop style earrings so I threw these in using the polar array feature in Gem Vision's, Matrix jewelry designer software. Also Gregore had just won a Spectrum award for hoop style earrings so they were still on my mind. I came up with five ideas and it was more fun to do so with the cut and paste feature of the software. Call or email if you like any of these designs for yourself or a different design for your gems.